Strawberry Road: Have a Heart Challenge! Hello Everyone and WELCOME to this week's challenge which is themed: "Have a Heart!" I know if you are a crafter or artist of any kind, you most definitely have a heart! Why not share a little of it with us in this super fun challenge? This theme instantly made me think of Wryn Have a Heart! I have this image in a cling stamp and I absolutely love it! For this card, I stamped Wryn on watercolor paper so I could experiment with copics and with delusions paints! What fun! The sentiment is from a Trevor Hall song which goes, "Love All, Serve All and Create No Sorrow". I just love that. Thank You so much for blogging by! I look forward to seeing your fruture projects! For info on Tiddly Ink's Design Challenge, please join us here! School Rules with Annie from Tiddly Inks! 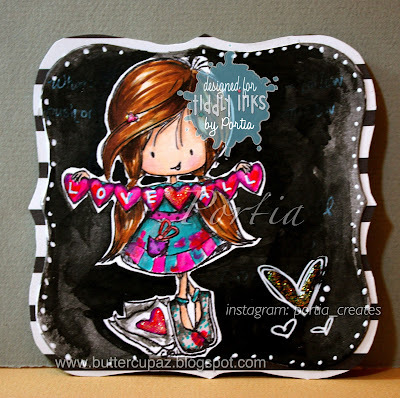 Fairy Tender Hearted Shaped Easel Card! Sweet Dreams of Sugar Plum Fairies!